I’ve been a Nintendo fan ever since I was little. My family had an NES sitting around... and I broke it by jamming a cartridge in it the wrong way. What? I was two years old, leave me alone. And then we had an SNES and that was that until we eventually got a GameCube, skipped right over the N64 unfortunately though luckily our neighbor had one. Throughout all of it, I played Mario, I played Zelda, I played Donkey Kong, Kirby, Smash Bros., Mario Kart, Mario Party, etc. but never once did I touch Pikmin. Heck, I didn’t even know Pikmin existed for the longest time and now after playing the third game in the series, I honestly regret that. The gist of Pikmin 3 is that three explorers from the planet Koppai have been sent to retrieve fruit seeds in order to solve a food shortage. Their ship is damaged in usual Pikmin fashion, scattering them to the four corners of the world. Gradually they discover the various species of Pikmin who, after being rescued, decide to help them collect the fruit they need. Short and simple yet still so good. 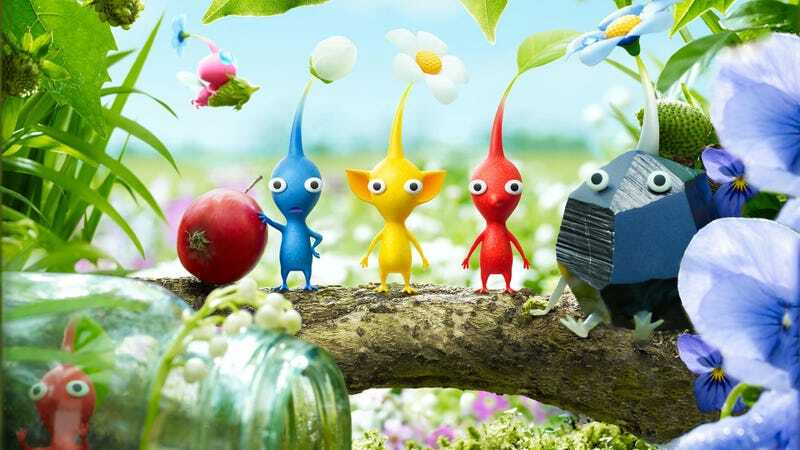 While the Pikmin don’t really say anything, they’re just so cute and in their own way they get you to like them, not that there’s anything to dislike. Alph, Charlie, and Brittany are also entertaining main characters, replacing Olimar as the protaginist. They each have their own personality quirks that make them likable. And all of this comes together to tell an entertaining story which at this point is just signature Nintendo. I do feel like I have to mention that if you read in between the lines this game is not all sunshine and rainbows like it appears to be. I mean think about it, every time you discover an Onion, it’s inactive and that particular Pikmin species is practically near extinction or in two cases actually extinct. And by all accounts Pikmin are sexless and don’t mate. In order to reproduce the Onion absorbs organic matter as a food source and then produces Pikmin seeds. And in Pikmin 3, the two primary ways of creating more Pikmin are as follows: 1) Collecting pellets from flowers, and 2) dragging the carcasses of defeated enemies over to the Onion and turning it into more Pikmin. That last one is kind of creepy in all honesty. I mean yeah it’s technically recycling, but seriously, just the image of a horde of Pikmin brutally murdering an enemy and then turning its corpse into more Pikmin is disturbing. For the sake of the game though you don’t think about it all that much because you get more Pikmin out of it. Of course, one last thing you take notice of is that in between each Pikmin game the various Pikmin species always seem to come close to extinction and the time between games, to my knowledge, isn’t even that long. You get a nice happy ending of the hordes of Pikmin seeing you off, and you’re content in knowing that they’ll be just fine. Then you return in the next game and the Pikmin are somehow back to square one. They seem intelligent, but sometimes I question that. The gameplay of Pikmin 3 is fairly straightforward. You find Pikmin Onions, create more of a specific Pikmin breed, and use them to complete various tasks whether it be knocking down walls, collecting fruit or objects, and killing enemies. You can have a total of 100 Pikmin on the field at once and they can be of various different types. Pikmin 3 has five different types of Pikmin that acquire one by one throughout the game. Red Pikmin which are immune to fire and the standard fighters, Yellow Pikmin who can channel electricity, Blue Pikmin who can breath underwater, Rock Pikmin who are good for breaking things and stunning enemies, and Winged Pikmin which are self-explanatory. Purple and White Pikmin only return in the side game modes, not the main story. I found myself almost always using a combination of Pikmin once I had more than one breed. At first I had a massive amount of Red Pikmin, like 80 Red Pikmin and 20 Rock Pikmin, and as I gained more breeds the number of Red Pikmin slowly declined until I took an even 20/20/20/20/20 across the board because you never knew what challenges you were going to run into. Of course, if you found that you needed more of a specific type of Pikmin, you could always return to the landing site and change them out. Normally fights aren’t all that interesting, you toss a few Pikmin, watch them beat the crap out of the enemy, and then move on your way. Exploring the absolutely gorgeous landscapes is the real highlight as you search for fruit. The boss battles on the other hand are the entertaining fights. You actually have to think hard and think fast to counter what the boss does. Each one changes it up and more often than not you’ll lose a good chunk of your Pikmin. Some of these fights will even last more than one in-game day if you aren’t on top of things. Which, I guess I should mention that you only get a limited amount of time to explore. Nights are dangerous, so you have to return to your ship and wait for the next day to keep exploring and collecting. If there are Pikmin sitting around that aren’t in your squad or not at the landing zone, they’ll perish as night falls. The fruit you collect also serves more than just being a plot device. You only need to take the seeds back to Koppai, not the whole fruit, so the fruit itself gets turned into juice which is your food source for the duration of the game. Some fruits yield one bottle of juice, others yield multiple bottles, while a few barely produce half a bottle. Most of your missions will be multi-day affairs, so taking the time to gather as much fruit as possible is a good idea so that you have a juice buffer and can complete missions on your own time without worrying about your food supply. Pikmin 3 is one of those games that proves that Nintendo knows how to use photo-realism to its full effect without making it seem dull. Everything is colorful and highly detailed. It looks better than it honestly has any right too as a Wii U game. There were times that I swore it looked like a PS4 game because it was just that beautiful. Rock Pikmin have both rough patches and smooth surfaces, crystals are transparent and actually look like they reflect light, water is clear and actually looks and moves like water, you get the idea. Even the fruit looks unbelievably good. Of course, I should probably mention that the game does occasionally get framerate drops, whether it’s during a battle when a lot of things are going on, or even when you’re turning fruit into juice. That last one is a bit weird because other than the liquid simulation going on, there’s nothing else that should be making the framerate drop like that. Of course that isn’t to say the graphics are always perfect. There are some textures, usually big ones, that got stretched just a little too far and it makes them appear blurry. You can also see edges on some items due to not having enough polygons to be perfectly round. There’s also a lot of aliasing, or at least, there is for me. To my knowledge Pikmin 3 runs at 720p, and on my 47 inch 1080p display, I see quite a bit of aliasing. However I could be wrong about the games resolution because there are Wii U games that run at 1080p, and in that case it can be chalked up to no anti-aliasing solution, or at least not the best one. I sometimes wonder what goes through Nintendo’s mind when they make some questionable decisions. It’s obvious that their golden years are far behind them at this point and it’s anyone’s guess if they will ever find that groove again that made them great in the first place. Pikmin 3 is a reminder of that golden era for me. It reminded me of the Nintendo games I used to play as a kid. It was fun and whimsical which is classic Nintendo. It’s what they’re good at and what makes a Nintendo system worth owning and I want more of that. Luckily a Pikmin 4 does exist, though rumors suggest that not only is it a reboot for the Nintendo Switch and is almost finished, but that it has been placed on the backburner while Miyamoto focuses his attention on the new Mario game. I’m really hoping that it’s a launch title, or at least a launch window title, and that it being placed on the backburner is just code for a slight delay. I may never get to play Pikmin 1 & 2, but I’ll be damned if I miss anymore Pikmin games.